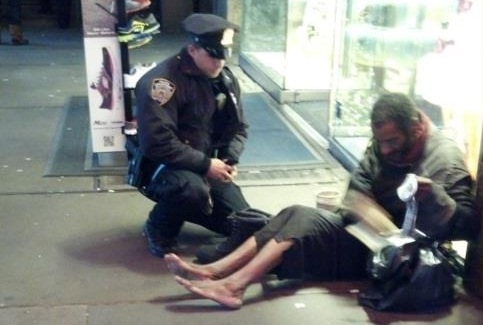 I was so touched when I read about the story of a police officer in New York City giving this homeless man socks and a $75 pair of Sketchers boots. According to police officer Lawrence DePrimo, a two-year veteran of the NYPD, “he had blisters about the size of my hands.” He felt sorry for the guy so he did a good deed and he paid with it out of his own pocket. Bravo! See, I was homeless when I was a teenager and when I was in my early 20’s, so any time I see anyone giving so generously to a homeless person who never asked for anything, it gives me hope. However, this homeless man, now identified as Jeffrey Hillman had allegedly “sold” or “gave away” his new shoes, according to an article that I read. Whether he did that or not didn’t diminish the good deed that Lawrence DePrimo did. I still have faith in humanity. “Jeffrey Hillman, who served in the military, is eligible for support through the federal Housing and Urban Development’s Veterans Affairs Support Housing program, Diamond said. The thing is, even knowing this “homeless guy” has an apartment, it doesn’t diminish the good deed done by Lawrence DePrimo who had no idea that the man he was helping didn’t need help. We shouldn’t all lose our faith in humanity just because this homeless guy turned out to be faking being homeless because maybe he gets enough money to pay his rent, but what about his food? Look at him, he’s skin and bones. Perhaps he really doesn’t have shoes, I mean, according to the officer, he had blisters about the size of his hands on the bottoms of his feet, so maybe he doesn’t get enough money to get by. What I’m really saying is, don’t be so skeptical about everyone because there are still some good people out there in the world doing good deeds. They say “one apple spoils the barrel” but that doesn’t mean you should give up on everything else from here on out. I still say that cop deserves a medal for his good deed and I thank him for his service and his gift.